I ordered a 2 kg box of mangoes as part of my online grocery shopping with the intention of making chutney. When it turned up, the mangoes were ripe to the point of looking over-ripe and spoiled. For chutney you ideally need slightly under-ripe fruit so I had to think again. The mangoes were in fact deliciously perfect but 5 large mangoes was too many to eat in one go! 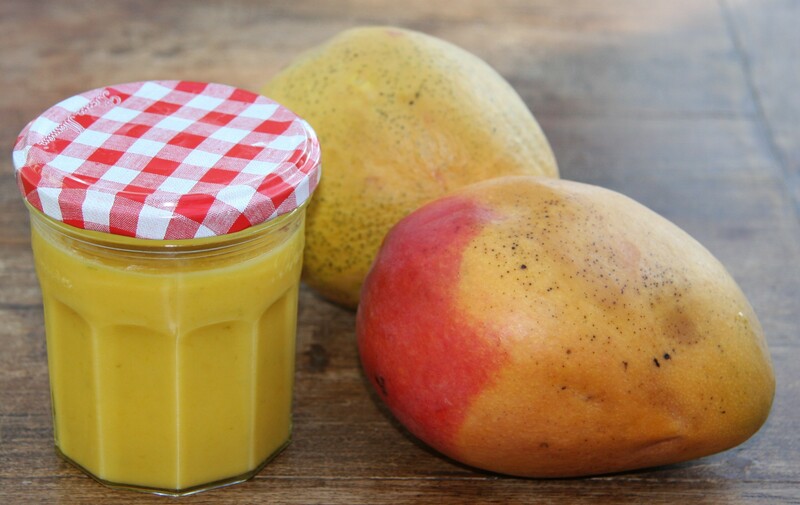 I puréed a couple and put them in the freezer for smoothies and found this mango curd recipe. It makes a really interesting change from the normal lemon curd, delicious as that is. Anything you can do with lemon curd I assume you could do with mango curd, from eating it on bread to filling cupcakes with it or using it as a sauce. It is made in half an hour and isn’t complicated. It will keep for a few weeks in the fridge so if you have a mango and have no idea what to do with it, give this a go! The recipe uses four egg yolks and I have been looking for a fruit curd recipe for a long time that uses egg yolks exclusively, for when I make meringue and have them left over. This time I used the yolks first so will be making a mango pavlova as well. 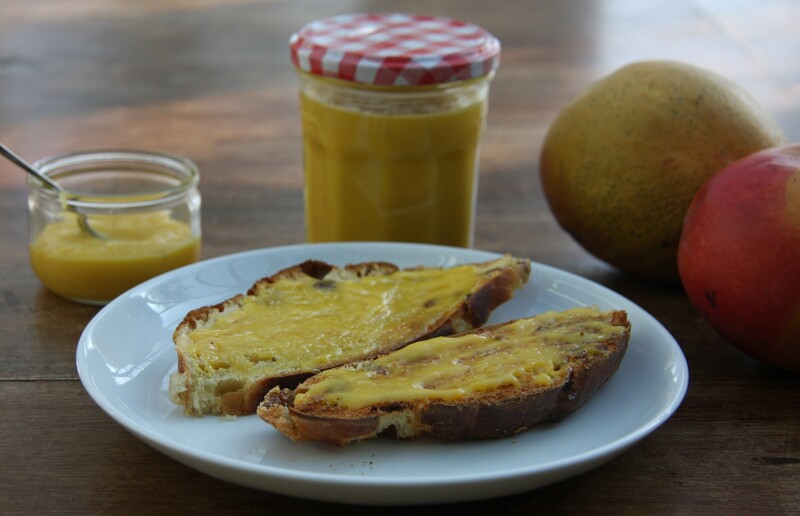 The recipe uses one large mango and a lime and produces a couple of small to medium sized jars of fruit curd. I recommend it for breakfast on toast. I had some homemade Fruit Bread left over that I toasted and covered in Mango Curd and it was delicious. You don’t need any butter or margarine with it because it is a rich mixture that already contains butter. Peel the mango and cut all the fruit off the central flat stone. Purée the mango flesh until smooth. Put the puréed mango, lime zest and juice, sugar, butter and egg yolks into a large heatproof bowl on top of a pan of simmering water. Do not allow the bottom of the bowl to touch the water. Stir constantly with a wooden spoon until the mixture is thick and coats the back of the wooden spoon. Pour the curd into hot, sterilised jars, cover and seal. When cold store in the fridge. This looks absolutely delicious, I’m a massive fan of any fruit curd, but have never made mango curd so will be trying this! I hope you enjoy it – I’m going to try mine in the pavlova and will be blogging the results! I have drunk a lot of mango juice/smoothies but never made mango curd. It’s a great way of using up excess mango that would otherwise spoil and also it must taste really nice? thanks for sharing. I will try this. It is really tasty and the lime takes the edge off the sweetness. Hope you enjoy it! I love mango and never thought about using it in a curd. What a great idea and it looks delicious on toast! It is delicious on toast! Hope you get to try it out. this sounds amazing! how long does it keep for in jars? The recipe books generally say a couple of weeks in the fridge but I’d be surprised if it didn’t keep for a lot longer than that. I think you’d know if it was going off as I would expect it would go mouldy, but I’m just guessing. Yum! I love mangoes! They are my absolute favorite fruit. This looks great! I had heard of lemon curd and had seen chef Rachel Allen make it on her show but I haven’t made it myself yet. I am definitely going to make the mango curd. I didn’t know you could make curds with fruits other than lemons! Thank you for this post! Thanks, I think you can make all sorts of curds, including passionfruit! I made the mango curd just now. I used Ataulfo mangos (from Mexico). They’re small and yellow but there is more fruit and less pit. I used my immersion blender so I didn’t have to strain it. I plan to spread it on my toasted blueberry bagel tomorrow for breakfast! Yum! A breakfast to look forward to! Now I want to try other curds! Hope you enjoy it, and all your new other curds too! Wow what a great idea! 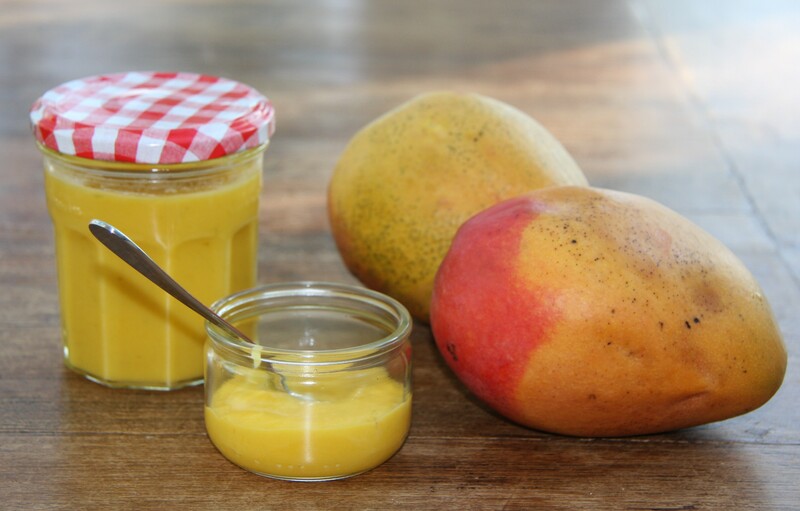 I am definitely going to have to make some mango curd this summer! I hope you enjoy it, thank you! This is brilliant! I’d never thought of mango curd. I recently made pineapple curd, inspired by Brooke of Adventures of a Cake Diva. And it was soooo good. This one is next on my list! That sounds really good too – I have been meaning to try passionfruit curd for a long time, as I think that would be really good, but never seem to get round to it! I Love, love, love passion fruit curd. It’s so delicate and perfumes the whole house! Check out my post on it. And it combines beautifully with mango in cheesecakes as well. I know the post you are referring to – I should have remembered that it was your post that made me want to make it!!! I hope I can be answered soon! I have a question. I want to make this as a Christmas desert under a Coconut Panna Cotta. My plan is to set the Mango curd first in the fridge before adding the Coconut Panna Cotta and setting that also (like in a fancy glass). My question was is the Mango curd set well enough to pour something on top without it going through? Hi, thanks for your question! I think that as long as you cook your mango curd so it is thick enough (and it will be thicker cold than hot, of course) it should be fine. I would also pour the pannacotta in over the back of a spoon. If your curd turned out too thin you could always put a layer on top? It sounds absolutely delicious, would love to hear how it goes. Happy Christmas! I love curd! I would love to make this. I can’t lie I’m going to cheat and used tinned mango. Hello! Thank you very much for the recipe 🙂 this looks like the perfect way to use up an excess of mangoes. Can you let me know if you mean 450g of mango flesh, or 450g of mango including the skin etc. If it is the latter, would you know roughly how much flesh that would be please? I’m using fairly small mangoes, so will me using more than one. Thanks very much! Hi, thank you very much for your question! The weight is the unprepared fruit so I think I would use about 500g unprepared small fruit, just in case the proportion of flesh to stone and skin is lower. Sorry not to be more helpful than that but I don’t think it will make too much difference. Hope you enjoy it! Thank you – would love to hear what you think! Hi could you tell me how many grams this mango curd makes. This looks amazing and will be trying this for my friends wedding cupcakes. Do you know how long the Curd will keep for in the fridge and or if it can be frozen. Hi, thank you very much for getting in touch. The curd should last maybe a month or more sealed in sterilised jars but only a week or two once opened. You can also freeze it if necessary. Hope you enjoy it!